It’s A New Year.. What Makes YOU Fierce? It’s a new year and one of my favorite words is FIERCE! It ignites my passion.. my desire to be strong.. my wish to be fearless.. my ambition to persevere and my goals of being unforgettable! A year ago in February, my Grama passed away. We were very close & I loved her with all my heart. She was one of my most special people: my cheerleader, my mom, my voice of reason, my greatest sounding board and LOVED to watch me dance! While I was back East for her funeral I stumbled upon a ballroom dance studio I had NO IDEA existed a few blocks from my home in LA. I contacted them while in NJ (I swear Grama sent me to them) and the rest is history.. I fell back in love with dancing because of the owners Katie & Erick (below) and the wonderful instructors (the events & other students are just a bonus). I started dancing at 10 yrs old. I taught, performed & competed all throughout school. I turned professional at the age of 19 and continued my career until 26. I taught ballroom at a Fred Astaire studio from 22-24 yrs old. 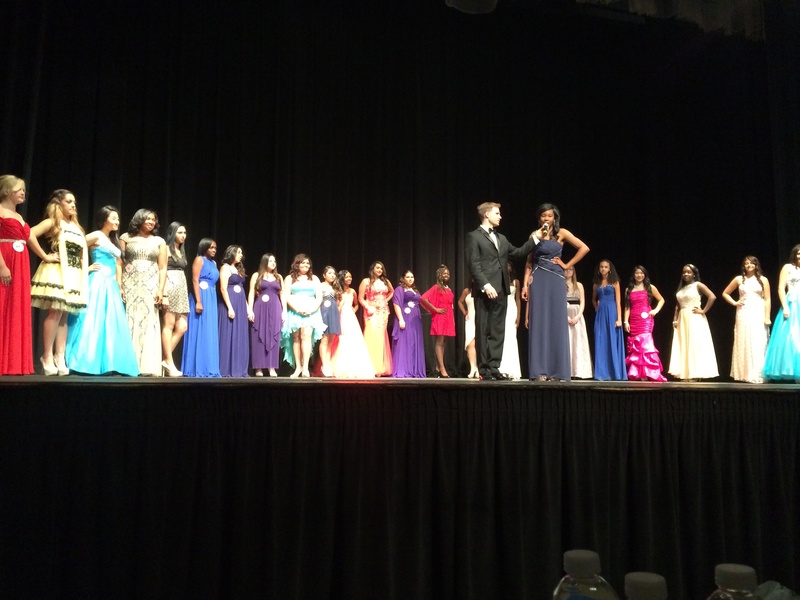 I lived my dream of being a dancer and performing professionally all over the country. But I hadn’t ballroom danced in about 15 years (even just for fun). Dancing has ALWAYS been my heart, my love, my joy, my passion. When I retired I couldn’t figure out how to enjoy it for fun.. so I gave it up. Last February I walked into the studio (shaking & heart pounding – thinking WHAT AM I DOING? I can’t do this anymore!) I was greeted by one of the sweetest guys I have ever had the pleasure of meeting (or dancing with) and I haven’t stopped smiling yet! In a year I have lost 25 pounds.. bought a dozen glittering gowns.. danced & sung more songs then I can remember, laughed uncontrollably (while dancing), felt like a princess (more than once) and entered my first EVER competition in December. I am FIERCE! I am having the time of my life.. inspiring others to dare to try something new.. sharing my joy, reminding others talent SHOULD be shared and hoping to become awesome in TANGO (my worst dance, in my mind) by this years end. I am not giving up! I have over done it and injured myself multiple times last year. But I’ve kept going. I can’t remember as much as I would like to or as quickly as I used to, BUT I AM FIERCE. I feel good. I’m graceful. I’m happy. I’m taking chances. I’m NOT giving up! What is it that you would LOVE to try this year? What lights a spark in your heart? What do you do and no matter how hard you try, you can’t stop smiling (this is a problem for my TANGO). Do that! Try that! If it scares you a little, it means there is a WONDERFUL treasure awaiting you on the other side.. it’s wrapped in a gorgeous package with a tag on it with YOUR name.. “YOU ARE FIERCE“.. It’s just waiting to be opened.. discovered.. shared.. and ONLY YOU can unwrap it! Remember, DON’T let anyone or anything STOP you.. especially when you soul is whispering to you.. listen to it! It’s usually IMPORTANT. Yes I’m talking to YOU! You are you know! I have to go with #Gorgeous for my “G”. Not only because of my business, but because I have been so inspired by honest, pure kindness & Random Acts of Beauty – the adjective to describe it all has to be GORGEOUS! I believe beauty when inspired, selfless & honest = Gorgeousness! 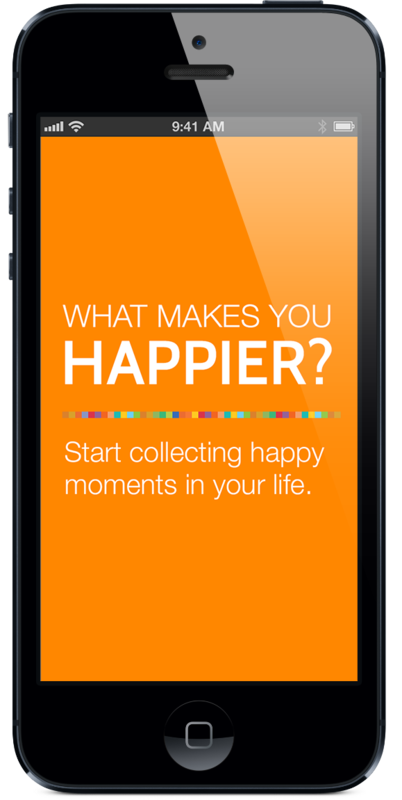 A few weeks later, a wonderful friend invited me to a new social media app I have fallen in love with #HAPPIER. It’s like Twitter & Instagram wrapped in Sunshine.. of course my new addiction. Inspiring & spreading Gorgeousness – OMG! Does it get any better? Why spread anything else but sunshine? I think that is my new “catch phrase” for doing good, inspiring, spreading joy & sharing love.. #sparklebomb -ing. My personal definition of #Gorgeous. 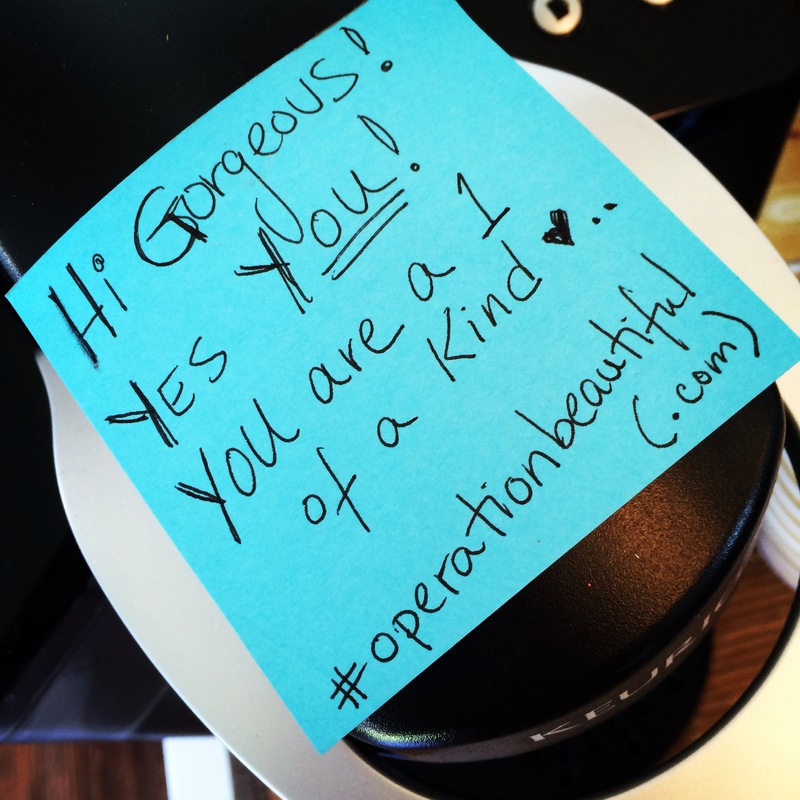 Then I stumbled upon #operationbeautiful. For me this is my daily story.. I am joining the movement to post-ing it forward with anonymous notes & random acts of beauty. You can see the story here.. @beautifulnotes. This is my first note left on a Keurig beverage maker. Gotta make someone smile for sure! What is your definition of #Gorgeous? As you can see I have ALOT of favorite “G” words (Grace & Gratitude probably fighting for the top position). Sometimes it is so hard to find ONE word to describe something.. so just start one letter at a time & #TellYourStory2014. We be listening.. be GORGEOUS today! WINTER BLUES got you down? 1. Paint your nails: A little color can make all the difference. Purple is the “IT” color for SPRING 2014 so start testing out some of your favorites. Adding a little SPARKLE on top always makes me smile. Product Pick: Love Zoya AWAKEN Spring 2014 line, especially Monet topper. 2. Take a bath: Warm water and some wonderful smells can take you to a whole new world. Play your favorite music, close your eyes and breathe deeply. Product Pick: Pandora’s peaceful stations never fail to lull my clients into beauty rest. 3. Grab an aromatherapy based lotion: Applying aromatherapy to your body will lift your spirits and help soften and smooth your skin from chapped, dry skin. Product Pick: I am addicted to Shea Butter based lotions with aromatic scents (KleanSpa does custom “scenting”). I can’t get enough! 4. Buy a new lip gloss: This works for me every time. Apply & Smile. Product Pick: Urban Decay has a beautiful new line of lipsticks for spring 2014. 5. Add bangs: Whether they are feathered, side swiped or curly – change can be good. It always grows back. 6. Give yourself a mini-facial: Clean your face and apply a mask, then take a shower. (Steam helps the ingredients penetrate) after you’re done wipe it off & apply coconut oil. Your skin will LOVE it! Product Pick: This hydrating mask from Boot’s look delish (love the ingredients). You can also just apply Honey. Works beautifully. Confession: So many brushes, so little time. There are no RULES.. but this may help you start. Everyone always asks me about brushes. Which one should I get for _______? Filbert (which is curved) Think of this as your finger. When choosing a brush, first think of the surface you are applying makeup to. Cheeks, eyes, face – this would work well for a ROUND brush. Liner, brows, contouring – you may want more of a FLAT line to blend. Under-eyes, lips, concealing creases – these areas are curved so a FILBERT would be just like using your FINGER. Make sense? 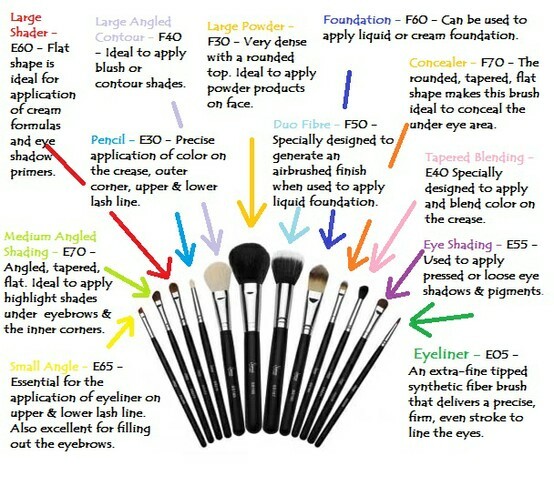 Here is a visual to help.. this is a good guide to help you choose the basics of brushes. Natural hair holds the product best (sable is the most popular and the more expensive, the nicer the hair). 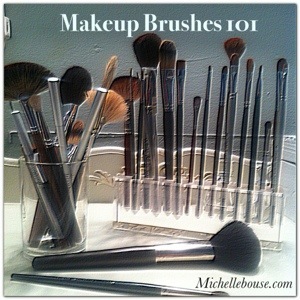 Synthetic brushes will not absorb the product and creams slide off the brush better. I use synthetic for special effects, glitter, cream liners, lipstick, etc. Powders tend to slide too much on the synthetic bristols and will discolor lighter hair fibers. If the brush is white or gold, ya synthetic. As you can see I am creative with my choice of brushes for my personal application. I do use some different choices when working on others. Please share with me what you find works great for you.. I love trying new brushes! ALWAYS remember to wash your brushes with shampoo or use brush cleaner and allow them to dry THOROUGHLY before putting them away. You should do this at least once a month. Thanks for stopping by and happy brushing.